Constable Benton Fraser: Liaison at the Canadian Consulate, unofficial partner to CPD Detective Ray Kowalski. Fraser and Kowalski's 'duet' seems to have his a sour note when communication appears to be a roadblock for them. Faced with a possible dissolution of the partnership and a mutual taking of transfers, the discovery of a dead pirate leads the men into one final case. Fraser's father makes appearances to give advice to his son about partnership being like a marriage and the importance of such a relationship. Fraser displays his vocal ability while singing "Barrett's Privateers", his deadly aim when, finally, a gun is placed in his hand, and, who can forget the impromptu swimming lesson and 'buddy breathing'. On the bow of the Bounty, with the bad guys caught and the world safe again, the partners confirm what they always knew -- their duet is back in harmony. Detective Stanley Raymond Kowalski, "Ray": When a heated moment leads to punches thrown by the banks of shipyard, Kowalski and Fraser realize their partnership has hit a roadblock. Already fighting the weight of wearing another man's name, Kowalski contemplates taking a transfer and admitting defeat, but a dead pirate puts a wrench in the plan. 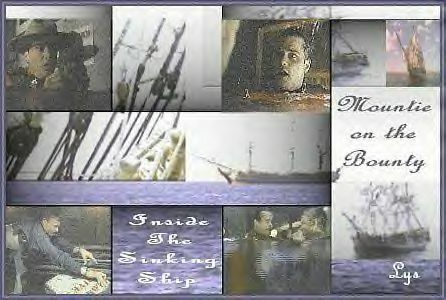 Because it matters to Fraser, Kowalski agrees to take on one more case - which will take them to Sault St. Marie to work as deckhands, will place Ray (and Fraser's) life in jeopardy in wildly dangerous ways - each time, despite the surface doubts, proving their partnership continues to be true. Harding Welsh: Lieutenant at the 27, joins forces with Inspector Thatcher to board the HMS Bounty and bring their men home safely. Jack Huey and Thomas Dewey: Fellow detectives from the 27 who assist in the investigation by locating John Thomas, one of the supposedly dead pirates. Francesca Vecchio, "Frannie": Civilian aide, sister to Ray Vecchio. She displays a genuine flair for original and unusual interrogation techniques. Inspector Meg Thatcher: Fraser's commanding officer. Teams up with Lt. Welsh and with Turnbull and Dief in tow, they meet up with the Mountie-crewed HMS Bounty to save Fraser and Kowalski. Constable Renfield Turnbull: A fellow Constable, lovingly daft - Turnbull not only sees action while upon board The Bounty, his skills come in handy to help pinpoint Fraser and Kowalski's location. Robert Fraser: Benton's father, a ghost, uses anecdotes of his own mortal life to assure his son that partnership is like a marriage. Sergeant Sam: The captain of the HMS Bounty who aids Welsh and Thatcher find Fraser and Kowalski, and then to take on the 'pirate ship'. Vic Hester: A member of the pirate crew, involved in the illegal dumping of toxic waste and retrieval of gold from a notorious robbery of the Chicago Federal Reserve Bank. Uses the legend of the downed ship, the Robert MacKenzie to continue the charade. Diefenbaker: Fraser's half-wolf companion. Joins Welsh, Thatcher, Turnbull and the crew of the HMS Bounty, in the search for Fraser and Kowalski.